I am a girly girl. Unapologetically so. I like all things feminine. I like pretty things, and I think pretty things like me back. Like these shoes from Not Rated. 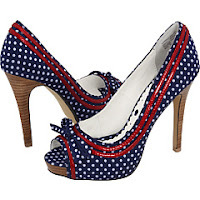 Navy with white polka dots and red accent ribbon: very classic feminine, no? This is Cover Look by Not Rated. I fell in love with them the minute I saw them. This shoe has that feminine, girly look down perfectly, with the pretty floral print and then adds a bit of punch with a tattoo up the back of the heel!